Environmental Protection Agency administrator Scott Pruitt has received an unprecedented amount of death threats, requiring a 24-hour security detail, according to an editorial published in the Wall Street Journal. The paper revealed the EPA has received more than 70 "credible threats against EPA staffers, with a disproportionate number menacing Administrator Scott Pruitt and his family," since President Donald Trump took office. "Reform in Washington is always difficult, but at the Environmental Protection Agency it's also dangerous," the WSJ editorial board wrote. "The EPA responded by beefing up his security detail, but Mr. Pruitt's political opponents are now trying to hold these warranted precautions against him." Credible threats from liberal opponents have resulted in the EPA's inspector general's office recommending 24/7 security detail for Pruitt, which is costing taxpayers $2 million per year. "Mr. Pruitt has received more than five times as many threats as his predecessor, Gina McCarthy," the editorial explained. "These include explicit death threats. Some have referenced Mr. Pruitt's home address. Federal law enforcement has determined that some of those threatening Mr. Pruitt are likely capable of carrying out acts of violence." Democratic lawmakers have complained that the security detail is a waste of money, claiming "there is no apparent security threat against the administrator to justify such a security detail or expenditures." "EPA security has already caught suspects prowling around the Administrator's neighborhood," the Journal reported. Liberals have justified the death threats. 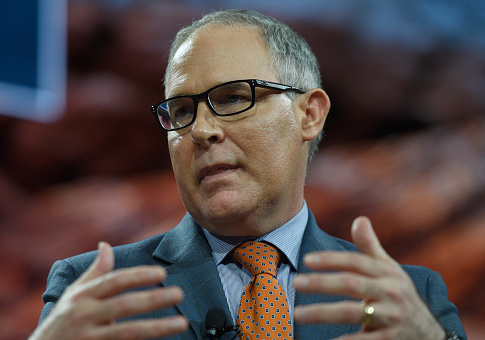 Last week, a San Francisco columnist argued death threats against Pruitt were justified because he is a "banally evil, milquetoast, science-denying government administrator." The death threats "make a warped sort of sense," wrote liberal columnist Mark Morford. "Mr. Pruitt didn't invent these threats, and Cabinet members shouldn't have to fear violence as a price of public service," the WSJ editorial board said. This entry was posted in Issues and tagged EPA, Government Waste, Scott Pruitt. Bookmark the permalink.